Bosque Village Eco-Experience offers visitors an opportunity to learn about natural building, plants and gardening, and the day to day physical work. Visitors will get the most out of this program for a week or more, but all are welcome to participate no matter how long the stay. Below is an example of a week of Eco-Experience. We do try to stick as closely as we can to the program below, but life occasionally offers surprises and we may need to shift things around depending on our emergency needs. Note that there are activities and classes available outside of the example program; your days can be as full as you want. Eco-experience guests are welcome to participate with free activities such as yoga and meditation every morning. Any extra costs are noted below. Arrive to Bosque Village and settle in. Energy systems tour of Bosque Village: solar panels, rain-water catchment, solar hot water heaters, solar ovens, wood-fired cooking, and social permaculture. Trail introduction. Learn about the Bosque trail system, and work on trail maintenance. Tour of Huerta Colibri (Hummingbird Orchards). Huerta Colibri is a neighboring organic food orchard with sustainable systems. The tour costs $5 USD. Optional: after the tour visit the nearby village tianguis – a weekly fruit and vegetable market with a wide variety of food grown within the state. Natural building introduction. Learn how to build with cob and adobe. 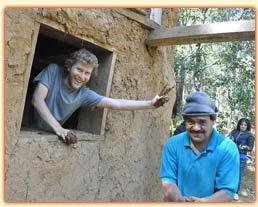 In the afternoon, browse our extensive learning library to discover more about cob, adobe, strawbale, and earthbag building. Plant propagation class. Learn about the variety of ways we propagate plants. Afterwards, depending on the time of year, join our gardening manager to plant trees, collect seeds, or water and tend to the gardens. Natural building. Learn how to finish with cob, and bring out your creativity as we decorate benches and hut exteriors with designs. Learn how to make a natural paint out of baba de nopal (slime extracted from the cactus plant), and use the paint in the decorations. Enjoy the Bosque. Relax, learn from the library, and watch an educational film about sustainable farming.